The Ram Heavy Duty lineup has long been known for its powerful Cummins Turbo Diesel engine but beginning later this year, those buyers opting for the light duty Ram 1500 will also be able to order their new Ram with diesel power. The 2014 Ram 1500 EcoDiesel will feature the same 3.0L V6 engine that debuted last month at the Detroit Auto Show in the new Jeep Grand Cherokee. This will officially make Chrysler and its Ram Truck brand the first automaker in America to offer a light duty diesel pickup. The Chrysler Group does not have specifications available for the Ram 1500 diesel engine but the company expects that this new oil burner will make the half ton Ram pickup the most fuel efficient truck in the class – a title which the Ram 1500 already holds thanks to the 3.6L Pentastar V6. Like the Pentastar, the EcoDiesel option in the 2014 Ram will be mated to the new 8-speed automatic transmission…which is another exclusive feature of the Ram 1500. While there have been no official specs announced for the 2014 Ram 1500 EcoDiesel, we can take some guesses at what to expect based on what we already know about the 2014 Jeep Grand Cherokee EcoDiesel. When that same 3.0L diesel V6 is used in the 2014 Grand Cherokee, it packs 240 horsepower and 420lb-ft of torque while offering 22 miles per gallon in the city and 30mpg on the highway in a rear wheel drive configuration. Add four wheel drive to the diesel Jeep and it still delivers 21mpg around town and 28 on the highway. Chrysler has stated that they expect the 2014 Ram 1500 EcoDiesel to be the most efficient truck in the class so it will have to best the Ram 1500 powered by the Pentastar V6. The most efficient package in the current Ram lineup is the Ram 1500 HFE, which offers 18mpg around town and 25mpg on the highway with a rear wheel drive configuration while the most efficient 4x4 Ram 1500 is the SLT package, which offers 16 and 23. Based on the fuel economy figures for the 2014 Grand Cherokee EcoDiesel, the diesel powered 2014 Ram 1500 should have no problem comfortably being the most efficient half ton truck in the market and should the Ram EcoDiesel model get anywhere close to the numbers forecasted for the Grand Cherokee – the diesel Ram will crush the competition in terms of MPGs. Most importantly, the 2014 Ram 1500 EcoDiesel will allow owners to enjoy these incredible fuel economy figures without compromising capability. While the Pentastar-powered 2013 Ram 1500 makes the half ton Ram the most efficient truck in the class, with only 305hp and 269lb-ft of torque, it is lacking a bit in power. However, even if the Ram EcoDiesel is launched with the same specs as the EcoDiesel Grand Cherokee, it will be one of the most powerful half ton trucks available in terms of torque output. 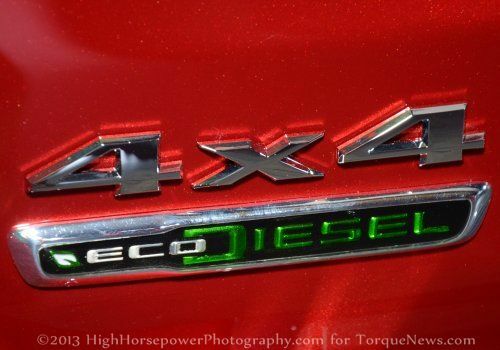 If the Ram 1500 EcoDiesel delivers the same 420lb-ft of torque as the Jeep, it will equal the class-leading torque levels of the Ford F150 EcoBoost V6 while also providing significantly better fuel economy figures. At the same time, this writer wouldn’t be surprised if Chrysler tweaked the 3.0L EcoDiesel a bit in order to afford them the bragging rights of having more torque than any other truck in the class. The 2014 Ram 1500 EcoDiesel model is expected to go on sale during the third quarter of 2013 and while pricing has not been announced, we can expect this to likely be the most expensive engine option in the Ram 1500 lineup. Leaked pricing on the 2014 Grand Cherokee EcoDiesel models indicated that the diesel V6 will cost Jeep buyers between $4,500 and $5,000 depending on the trimline chosen so we can expect that the new EcoDiesel in the Ram will be a more costly engine option. However, that is a small price to pay for a truck that offers both the best torque in class and the best fuel economy in the class.